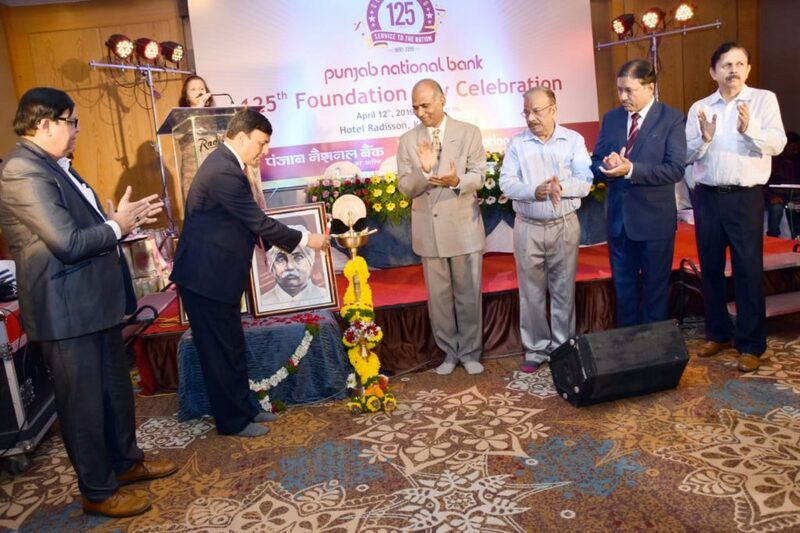 Pune – Punjab National Bank celebrated its 125th foundation Day at Radisson Blue Hotel, Kharadi on 12th April 2019. Mr.Chokhalingam, IAS Settlement commissioner and Director of Land Revenue (Chief Guest), Mr. M. K. Aurora (Guest of honor) Mr. Sanjaya Kandpal, Pune Circle Head, Mr. Sanjeev Gautam, Dy. Circle Head, Mr. Sunil Page, Dy. Circle Head and Mr. Anil Kokil, Chief Manager, Bank’s staff/Ex staff, officials and valuable clients were present on this occasion. Mr. Sanjaya Kandpal welcomed the guest and in his speech briefed about history of “Punjab National bank” .PNB was founded in 1894 has seen two world wars and so many up and downs. In spite of all challenges our Bank has completed glorious journey of 124 years and entering on 125th years. It was possible only because of active participation of all stake holders including staff and retired staff members, people’s faith in Bank, use of modern technology and management. Our Bank is the second largest Bank in India and serving more than 100 million people through its seven thousand branches around the globe. He congratulated all stakeholders and Bank staff for grand success. Sh. Choklingam congratulated Punab National Bank for getting younger of 124 year and entering in to 125th year. He highly appreciated the passion and dedication of the management and staff and said it is a great thing to remain for long time at present scenario.While providing the some tips for the Banker, he said presentation with good packaging is a need of the hour. Strong communication and better presentation of Banks schemes, use of data will be the key to success. He said that now, bank’s board will get more freedom for formulating new policies for growth and development. A film on the history, present situation of Bank and cultural programmes were presented on this occasion.